How much free time do you have lately? Did that question just make you laugh out loud? These days, we are pulled in so many directions and we have so many demands placed on our personal and professional lives that the idea of free time usually stays just that — an idea. But what if there was a way to bring a higher level of efficiency to our lives? What if you were able to focus on achieving your goals instead of checking on a seemingly endless list of to-do’s? How could this change the quality of your life? How much free time would you be able to open up for yourself? That’s what the Rapid Planning Method, or RPM planning, is all about. RPM is more than a time management system – it’s a way of thinking that can help you to better organize your life. How does the Rapid Planning Method work? By helping you to focus you on the key results that are most important in your life, so that you can maximize your desired outcomes as well as your sense of fulfillment and joy. The reasoning behind this method is that when you have a clear sense of purpose driving your actions, you’ll be more driven to do whatever it takes to succeed. One of the core components of RPM is what we call chunking, which is an extremely efficient way to get more done during your day. This is the most effective chunking definition – chunking is the grouping together of information into ideally sized pieces, so they can be used effectively to produce the outcome you want without stress or shutdown. This method is used by Tony Robbins to manage his schedule, as well as by hundreds of thousands of people all over the world. 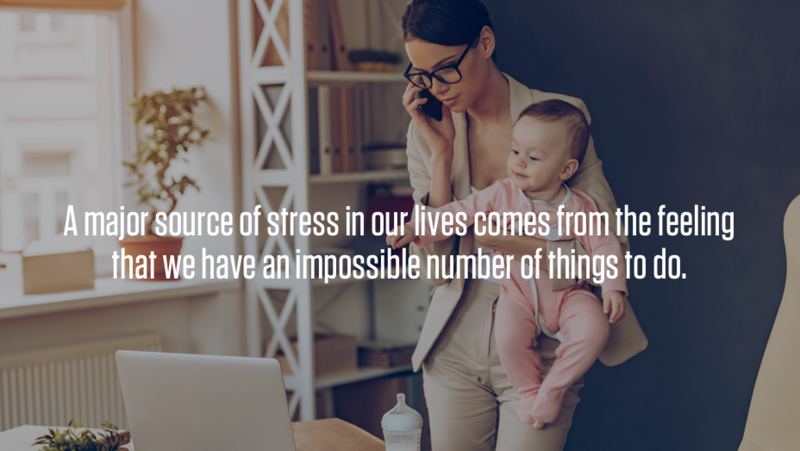 You see, a major source of stress in our lives comes from the feeling that we have an impossible number of things to do, and no time to do them. When we start feeling overwhelmed by what we need to get done, we do things like create to-do lists to feel more organized, but then become frustrated by the sheer number of things on the list before we even start tackling tasks. We’ll often take an objective and pull it apart into a million pieces or tie it all together into one abstract whole. For example, if you take on a project and try to do the whole thing all at once, you’re going to be overwhelmed. And similarly, if you take a task and break it into too many small steps, it’s equally overwhelming, daunting and frustrating. So what’s the solution? No matter how skilled you are at multitasking, most people can only focus on a limited number of things at one time. When most people are learning, they tend to remember things that are grouped into three’s. And anything above three things becomes too much for us to remember. In other words, most people tend to get overwhelmed after three difference pieces – or chunks – of information. When people don’t reach their goals, it’s often not because they lack the ability or will power to accomplish their objectives. It’s because of the way they’re focusing on the number of items, or rather, the way they are chunking things is inhibiting their success. By taking all that is coming at you and putting it into ideal-sized groups your mind can more easily handle, you are positioning yourself to accomplish your goals and achieve further success. So, what’s the best way to begin effectively chunking? To begin the chunking process, you must get the ideas out of your head and onto paper (or into your computer or mobile device – anywhere where you can record your thoughts). We call this process capturing. Keeping everything locked up in your mind is just another way to add stress to your life. You need to adopt a routine where you always put down the things you want or need to accomplish. 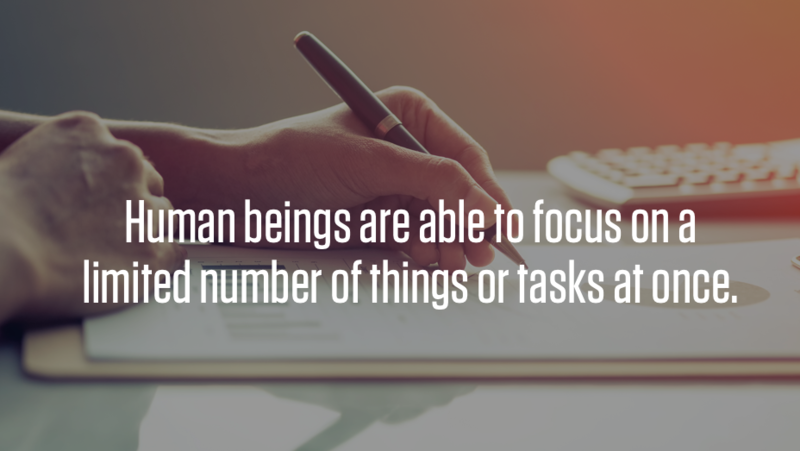 Remember, human beings are able to focus on a limited number of things or tasks at once. Usually, anywhere from five to nine items can be handled at a time before we lose focus. Document the ideas, meetings and communications you need to handle and the required results for each section. Capture the things that are a must for you to accomplish, whether they are the things you really want, like getting a promotion at work or situations that demand your attention, like doing laundry or picking up your kids from soccer practice. Write down everything you have to do this week. Consider this a dumping ground for your thoughts. Now that you’ve captured the things that are a must for you to accomplish within a week, begin looking for commonalities. What items relate to finances, relationships or your career, etc.? Chunk those items on your capture list that correspond to the most common areas of life mastery: health, meaning and emotions, relationships, time, work/career/mission, finances and even spirituality. Now that you’ve chunked these items together, it is easier to see what the result you desire is – to sustain and nourish the relationships that are crucial to your life. In the example we gave above, the clear result is to improve your connection with your loved ones. When you’re driven by your ultimate purpose, instead of the need to check items off a to-do list, you’ll feel more productive and less stressed. When you feel less stressed, you find more reasons to act instead of making excuses. When you start thinking of your to-do’s as clusters of desired outcomes, you’ll keep stress at bay and learn to focus on your greater goals, rather than getting overwhelmed with the minute details. Why? Because you will start to feel inspired, rather than forced to follow through. And when you feel so inspired by a purpose, you’ll come up with a more effective action plan to get there. There are so many things competing for and demanding your attention in life, if you don’t make a conscious effort to decide in advance which things you’re going to focus on, you’ll live in reaction to demands of the moment. Focus is the ultimate power that can change the way we think, the way we feel and what we do in any moment. 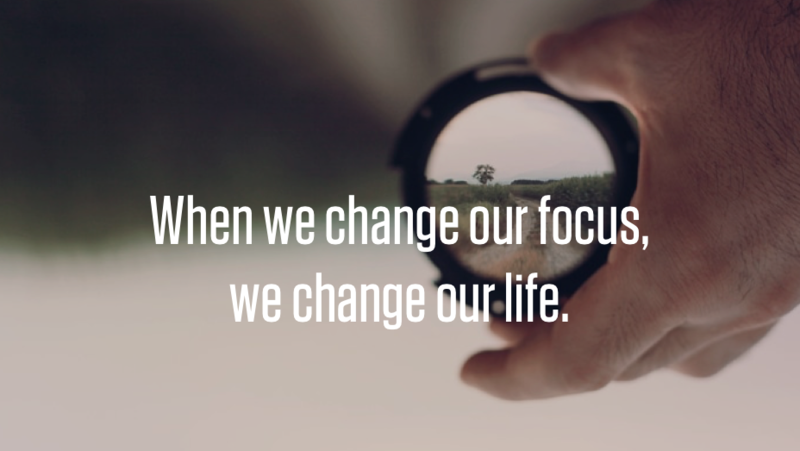 When we change our focus, we change our life. Start chunking today, and shift your mindset to focus on a brighter future.